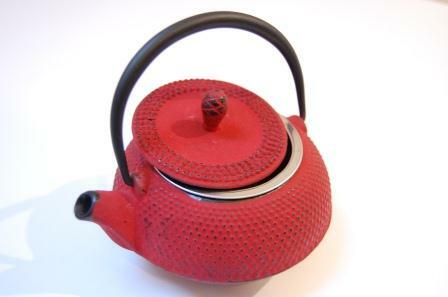 These great little Japanese Tetsubin teapots are made from cast iron. Once hot they keep your tea warm for longer than a porcelain or ceramic teapot as the relatively thick metal retains the heat well. They are very easy on the eye and feel solid and weighty in the hand. This model is finished in black enamel on the inside and the iron is painted a matt bright red outside. Measurements: 11cm diameter by 7cm high / 300ml volume.